During the holidays my family gets together and each of us are in charge of bringing a dish or two. Glazed carrots is a family favourite! Here's the recipe I've been using since I can remember. In a medium skillet, melt butter. Add brown sugar, honey, nutmeg and cinnamon; mix together. Add carrots. Cover; cook on medium low to medium heat for about 15 minutes, stirring occasionally. 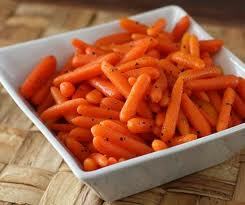 When finished cooking, the carrots should be firm, not mushy. Remove from skillet and sprinkle with fresh parsley and/or chives. Serve.